Are you trying to eat (and weigh) less? Then maybe it's time for a little redecorating. I'm sure you're wondering what I'm saying but dieters usually rely on willpower alone and don't understand why their diets fail. That's because it's hard to lose weight if you're in an environment that does not support healthy eating. 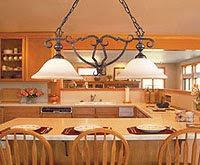 And when I say "a little decorating," you can start with the lighting in your dining room. I've read that bright lights encourage you to eat faster than you otherwise would because they make you feel stressed. A dark room on the other hand will lower your inhibitions, which means you're more likely to have dessert. Experts suggest using medium-wattage bulbs, so you can see well enough but don't feel like you're in an interrogation room.